GEOSS Mid-term Evaluation Architecture and Data Committee – March 2010 Yana Gevorgyan GEOSS Evaluation Team. 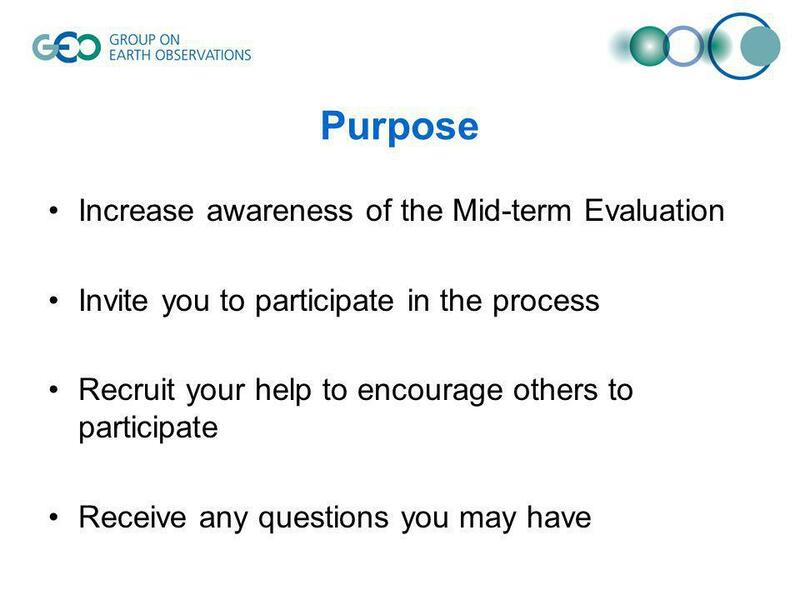 4 Why a Mid-term Evaluation? Feedback to improve GEOSS planning and implementation. 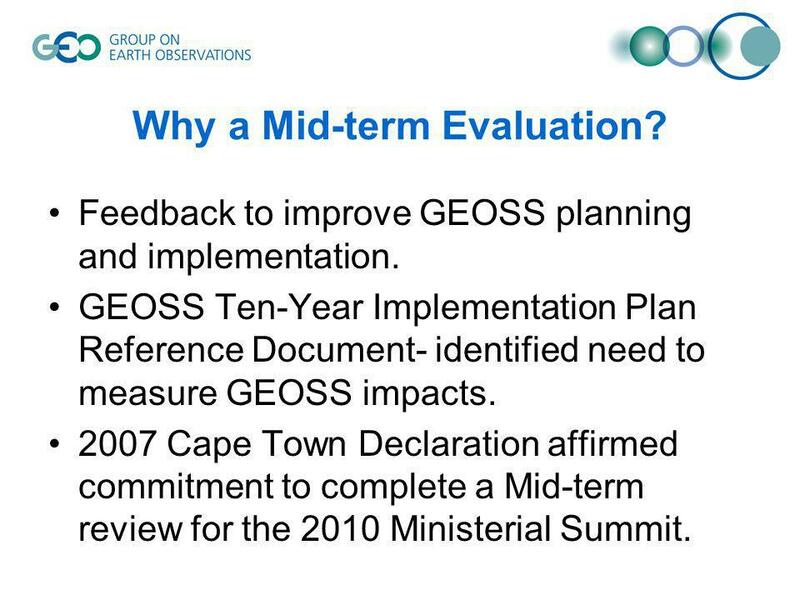 GEOSS Ten-Year Implementation Plan Reference Document- identified need to measure GEOSS impacts. 2007 Cape Town Declaration affirmed commitment to complete a Mid-term review for the 2010 Ministerial Summit. 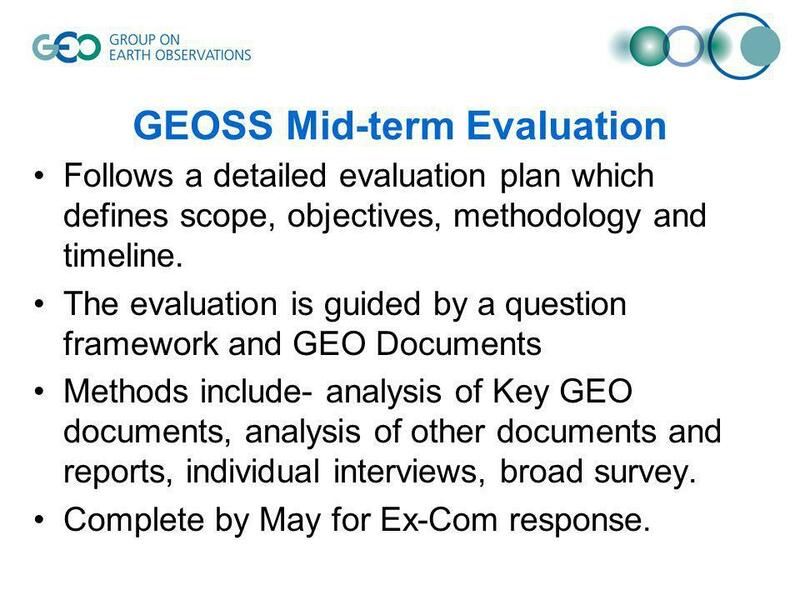 7 GEOSS Mid-term Evaluation Follows a detailed evaluation plan which defines scope, objectives, methodology and timeline. 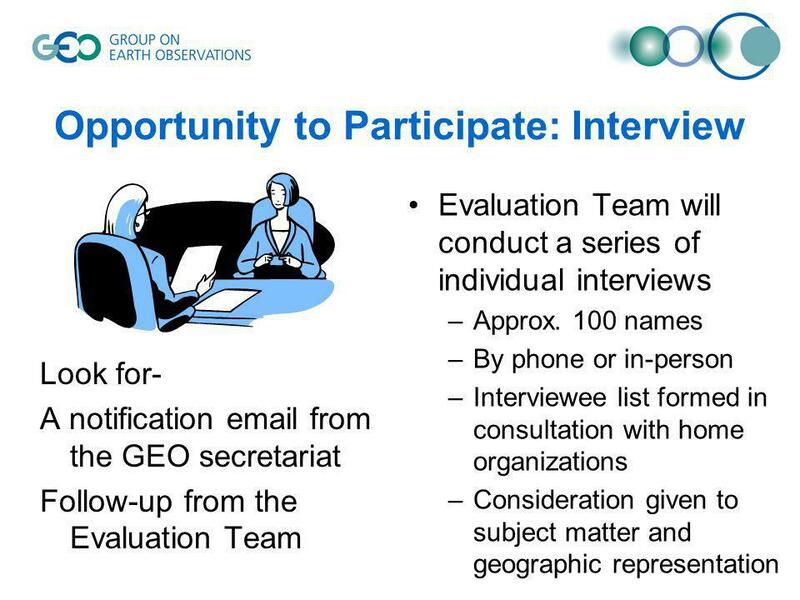 The evaluation is guided by a question framework and GEO Documents Methods include- analysis of Key GEO documents, analysis of other documents and reports, individual interviews, broad survey. Complete by May for Ex-Com response. 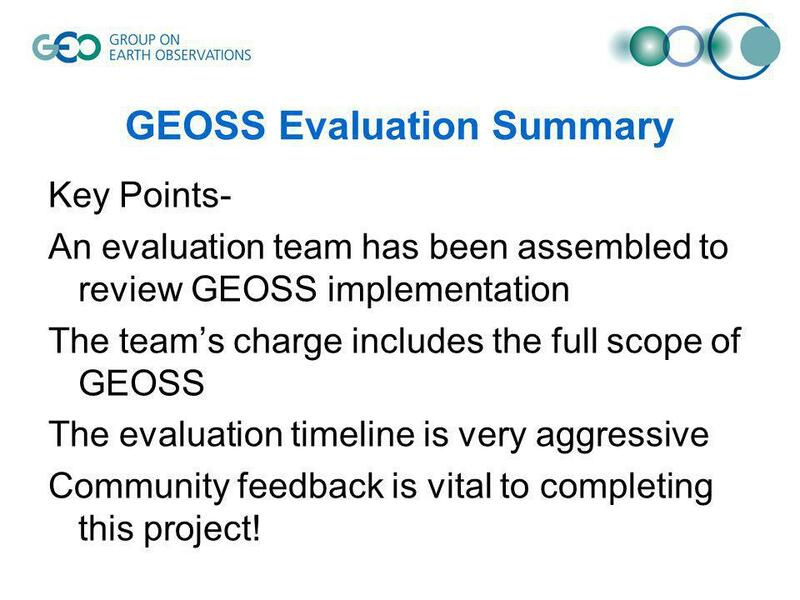 8 GEOSS Evaluation Summary Key Points- An evaluation team has been assembled to review GEOSS implementation The teams charge includes the full scope of GEOSS The evaluation timeline is very aggressive Community feedback is vital to completing this project! 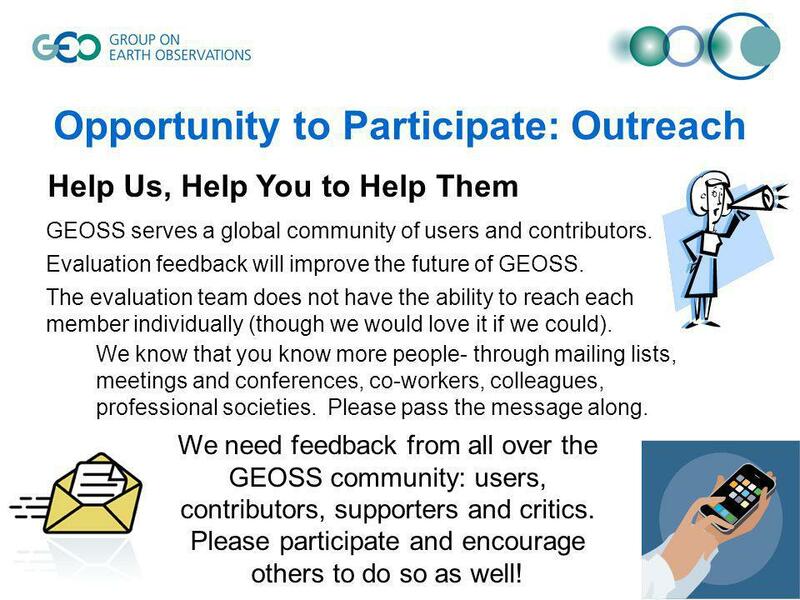 13 Opportunity to Participate: Outreach GEOSS serves a global community of users and contributors. 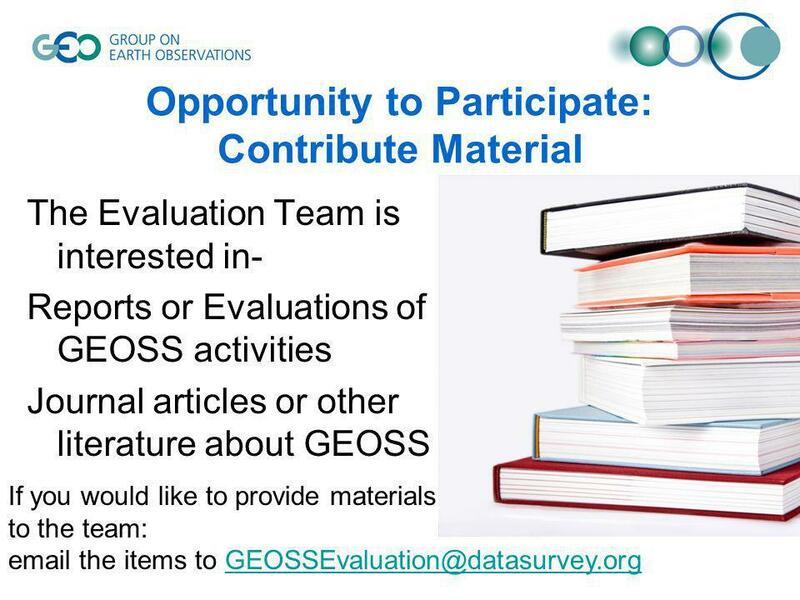 Evaluation feedback will improve the future of GEOSS. 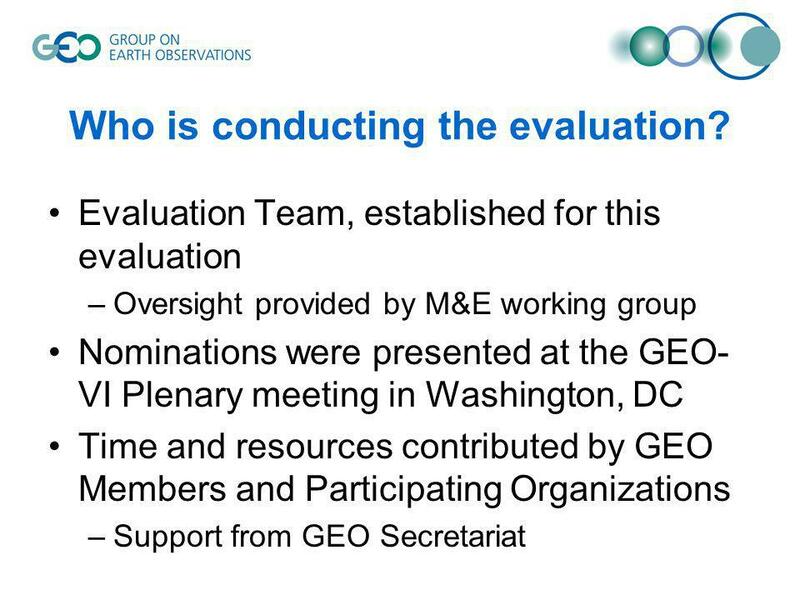 The evaluation team does not have the ability to reach each member individually (though we would love it if we could). Help Us, Help You to Help Them We know that you know more people- through mailing lists, meetings and conferences, co-workers, colleagues, professional societies. Please pass the message along. 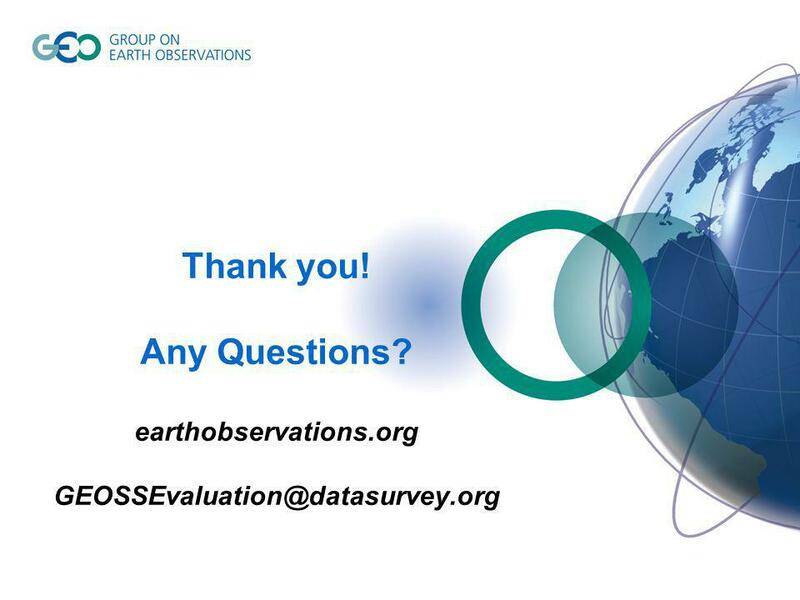 We need feedback from all over the GEOSS community: users, contributors, supporters and critics. Please participate and encourage others to do so as well! 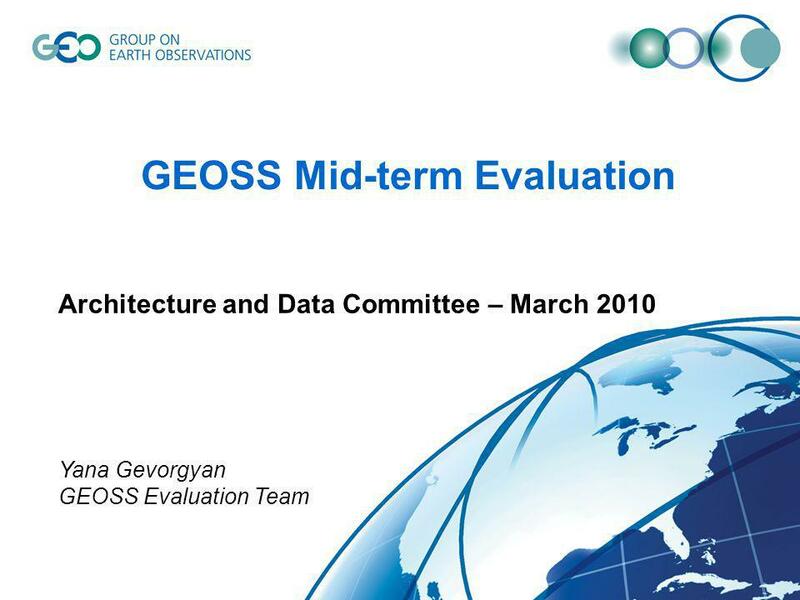 Download ppt "GEOSS Mid-term Evaluation Architecture and Data Committee – March 2010 Yana Gevorgyan GEOSS Evaluation Team." The IEEE Committee on Earth Observation Dr. Jay Pearlman, Chair Dr. Tom Wiener, Chair elect November 15, 2007. Work Plan Development Guidelines and Schedule. International Cooperation Subgroup (ICSG) International Cooperation Mechanism International Cooperation Subgroup Co-Chairs Patricio Bernal (IOC) Harlan. GEO-5 in Ottawa 1 29 November 2004 Draft GEOSS 10-Year Implementation Plan and Status Report on Reference Document Ivan B. DeLoatch, Toshio Koike, Robert. © GEO Secretariat THORPEX-TIGGE Overall Concept What? –TIGGE: THORPEX will develop, demonstrate and evaluate a multi- model, multi-analysis and multi national. 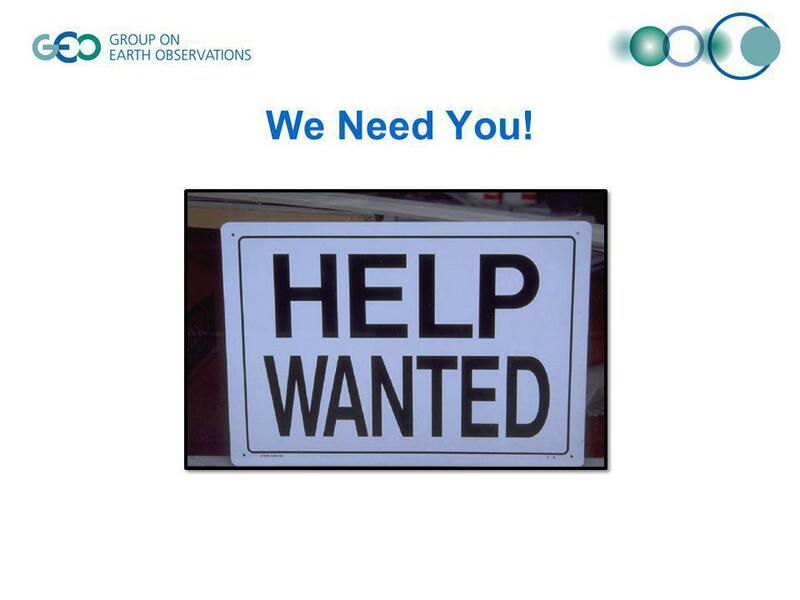 Call for Proposals: Earth Observations in Decision Support Joint Effort of GEO Capacity Building Committee and User Interface Committee March 2009. 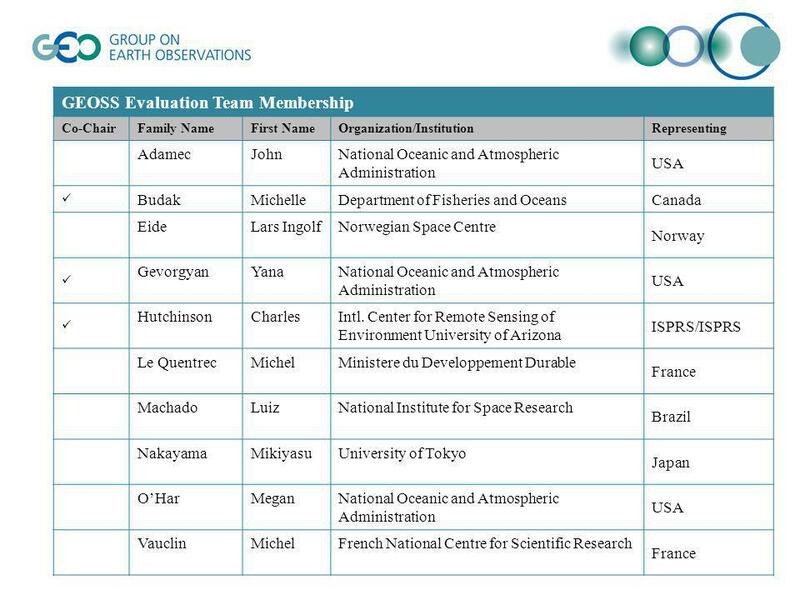 © GEO Secretariat GEOSS GEO Grid - SDCP- Scientific Officer, GEO secretariat. GEOSS Data Sharing Task Force Report: Implementation Guidelines for the GEOSS Data Sharing Principles Alan Edwards, Co-chair (European Commission) On behalf. 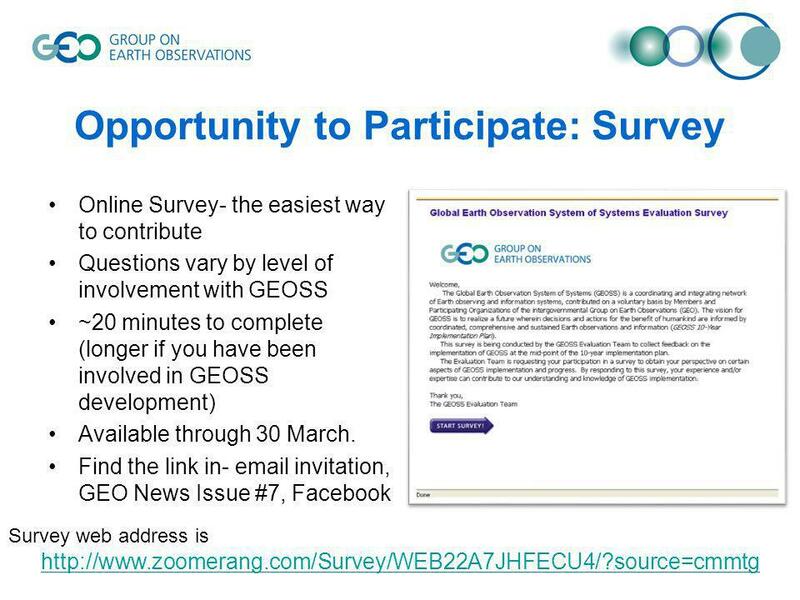 GEOSS Data Sharing Principles Alan Edwards European Commission Report to Capacity Building Committee May 22, 2008. 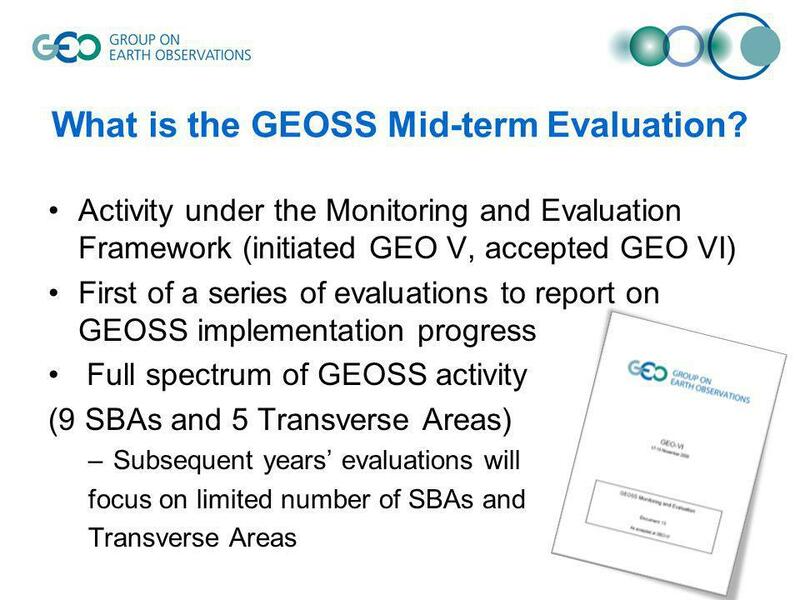 Overview of the Summary Plan for the First Evaluation of GEOSS Implementation Craig Larlee (Canada) M&E WG Co-Chair Joint meeting of M&E WG and ET January. HELPING THE NATION SPEND WISELY Angus Waugh SAI-UK IntoIT The INTOSAI IT Working Group Journal Beijing, April 2010. ST-09-01: Catalyzing Research and Development (R&D) Funding for GEOSS Florence Béroud, EC Jérome Bequignon, ESA Kathy Fontaine, US ST-09-01 Kick-off Meeting.